In my own patch of the scholarly world, I think economic forecasting will (eventually) be revolutionized by social media. That is so massively horrendous (in the good sense). Thank you for making me aware of the story in all its aspects. As for how social media help contribute to science, they certainly allow for a quickening pace of sharing ideas, hypotheses, etc., as long as the scientists using them maintain high ethical standards of attribution and disclosure. The pace of science can then maintain, and increase, the speed it’s been enjoying. Dissemination of information in this, the Internet Age, is going to be one of the major driving forces behind cultural evolution in the near future. Crowdsourcing of computer programs is already mainstream, and social memes which begin on the Internet are swiftly leaking out into meatspace. NASA is asking people to search for asteroids. SETI is asking people to donate computer resources. Wikipedia is swiftly being taken to be a valid source of information, even with the stigma of being editable by anyone. There are numerous websites where all of the content is user-generated. I’d like to think of this as a trend. Personally, I hope it continues. 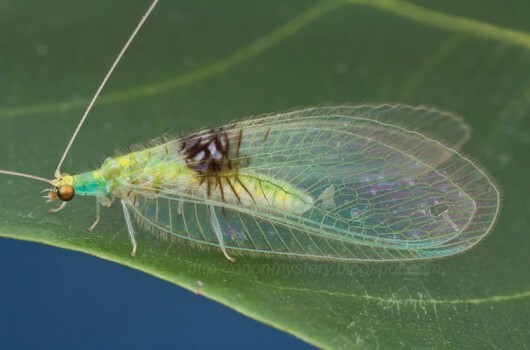 I think the best part of the story is that the entomologist was browsing photos of lacewings on Flickr. I presume that this was in his free time. There is intelligent life in the deep south, but it has a tendency to migrate north or west on its 18th birthday, or perhaps not until the end of university. And some of us stay here and attempt to stamp out ignorance! I grew up fossil hunting and dreamed of this kind of thing. A few years back I collected a fossil that I figured was a samara but a scientist (via a friend) saw my flickr photo and based on age, location, didn’t think that fit, wanted a closer look to identify the thing. Turns out that the thing had been dumped/trashed/broken in my brother’s yard. A “field trip to the locality” idea never worked out. Still have my lonely flickr photo of it though. The internet is a wonderous thing. Although it does seem unjust that the species was named after Winterton’s daughter and not Guek.